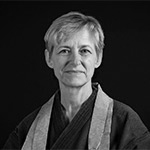 Dr. Ginny Whitelaw is the founder of the Institute for Zen Leadership, a Zen Master in the Chozen-ji line of Rinzai Zen, as well as President of Focus Leadership. She is a recognized expert in leadership development and executive coaching and has authored 4 books, including The Zen Leader. A biophysicist by training, she combines a rich scientific background with senior leadership experience at NASA, and more than 20 years developing global leaders. Together with Mark Kiefaber, she developed the FEBI® to measure 4 mind-body patterns of personality, and trains practitioners worldwide in how to apply FEBI in their work. She has served as adjunct faculty to Columbia University’s senior executive program and worked with leaders in some of the world’s top companies, including Merck, Dell, Avon, XL Capital, Sprint, Cemex, EMC, Novartis, Hospira, Marsh, Ascension Health, T Rowe Price, and Bank of America. Prior to that, Dr. Whitelaw spent 10 years at NASA, where she became the Deputy Manager for integrating the International Space Station Program. She led a large-scale change effort to re-align the management of the Space Station Program using cross-functional teams. Her work became a model for other NASA programs, and she was awarded NASA’s Exceptional Service Medal for her efforts. She holds a Ph.D. in Biophysics, as well as a B.S. in Physics, a B.A. in Philosophy, and a 5th degree black belt in Aikido.